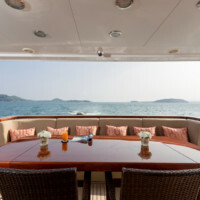 Bilgin T100 is available for private yacht charters in Phuket. 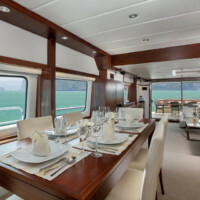 Luxury Motor Yacht Charters Phuket with Boat in the Bay. 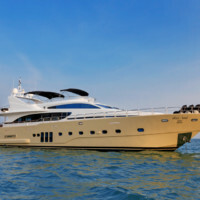 You will like this motor yacht for her luxury, comfort, and a wide selection of water toys. Following an extensive refit completed towards the end of 2015, this Bilgin Motor Yacht is in immaculate condition with numerous upgrades, replacements, and a brand- new, tasteful interior. 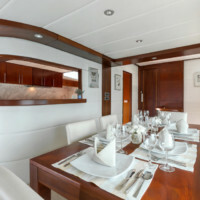 The yacht accommodates 8 guests in 4 cabins. The full-beam master cabin with tall, vertical windows on port and starboard has a walk-in wardrobe and en-suite bathroom with a bathtub. 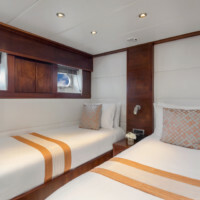 The full-beam VIP stateroom is seemingly even more spacious with a high ceiling and an abundant natural light. 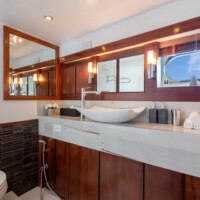 The two twin cabins have en-suite bathrooms and an individual entertainment system. Children and adults alike will enjoy the Jacuzzi and the comfy cushioned sun pads on the flybridge, offering panoramic views. There are abundant deck space and lounging areas to work on a suntan. 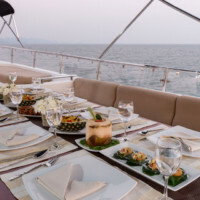 And an awesome selection of water toys and water sports activities guarantees a fun-filled yacht charter vacation! This Bilgin T100 is one of the few Thai-flagged luxury charter yachts available in South-East Asia and is currently based in Phuket. She is ideal for families with children, a corporate cruise, or a holiday with friends. Captain Chris (UK) and his excellent crew of 5, including a simply wonderful Thai chef, are on stand-by to show you the most beautiful islands around Phuket and southern Thailand. 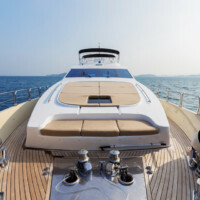 More information about Bilgin Yachts from their website. 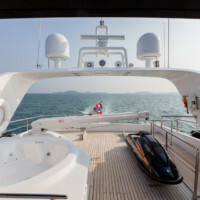 Contact Boat in the Bay for the Bilgin T100 charter inquiries and other Luxury Motor Yacht Charters Phuket.